Hey, y’all! I may have had a Paula Deen moment in my kitchen this weekend. There may have been some cheese frying going on. Well, technically the cheese itself wasn’t actually fried. But it sure did get all melty inside some crispy, crunchy wonton pyramids. And don’t forget about that Bacon Apple Jam. I had a wicked Mississippi accent when I was growing up. As I got older and left home for college, I lost a good bit of the accent. Many of my friends weren’t from the South, and there was some effort on my part to avoid having my background so easily distinguishable. I sometimes forget how to fall back into that southern drawl, but my blogger buddy, Greg over at Sippity Sup, reminded me that the correct southern pronunciation for this common southern delicacy is “puh-MEN-ah” cheese. I’ve posted several pimento cheese recipes over the last couple of years, and this one might be my favorite so far. The number of uses for this versatile spread is only limited by your imagination. These crispy wontons are best served just a couple of minutes after coming out of the oil, and, of course, with a big schmear of Bacon Apple Jam. To make these wontons, place a generous tablespoon of pimento cheese in the middle of a wonton wrapper. Brush beaten egg around the edge of the wonton wrapper with a small basting brush. Be careful to not get egg on outside of wrapper. (I tried one batch where I sealed the wontons with water, and they opened up in the frying process.) Bring two opposite corners of the wrapper together and pinch to seal. Bring the other two corners together and pinch four corners to seal. Using your fingers, seal the seams of the wrapper on each of the four corners. It’s been a while since I heated up a pot of oil and fried something. Considering I’ve been pretty militant so far this year with our diet, it was high time that I indulged, and I don’t regret it one little bit! 1. Brown bacon in a large skillet until crispy. Remove bacon from skillet and chop when cooled. Drain off all but 2 tablespoons of bacon grease in skillet. 2. Transfer onion to skillet and cook for 2 to 3 minutes over medium high heat. Add garlic and apples and continue cooking for 4 to 5 minutes until onions and apples are tender. Add vinegar, maple syrup, espresso powder, mustard, salt, and pepper. Stir to combine. Reduce heat, cover and simmer for 15 minutes. Remove from heat and cool completely. 3. When cooled, transfer jam and reserved bacon to the bowl of a food processor. Pulse 6 to 8 times. Do not over process. 1. Place a generous tablespoon of pimento cheese in the middle of each wonton wrapper. Working one at a time, brush beaten egg around the edge of the wonton wrapper with a small basting brush. Be careful to not get egg on outside of wrapper. 2. Bring two opposite corners of the wrapper together and pinch to seal. Bring the other two opposite corners together and pinch all four corners to seal. Using your fingers, seal the edges of the wrapper on each of the four corners. Repeat with remaining wrappers. Make sure wontons are completely sealed. 3. Add roughly 2 inches of oil to a large Dutch oven and heat to 375 degrees. Cook wontons about 4 to 5 at a time for 1 to 2 minutes until golden brown. Remove from oil and drain on paper towel. Serve with Bacon Apple Jam. Love pimento cheese. Even though I pronounce it wrong. 😉 I’ve actually made something somewhat similar to this in the past, when I was just messing around in the kitchen. Yours looks better, though. And that jam looks wonderful! Thanks. 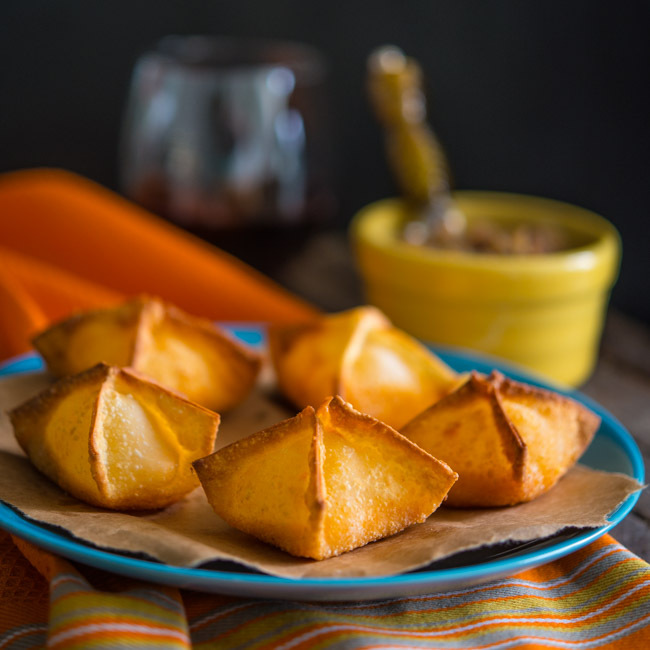 I can so see myself polishing off a lot of these cheese wontons.. they look and sound so moorish and delicious – and I am loving the addition of a bacon & apple jam! Yum! I don’t know what I’m more excited about! The wontons or the jam! I make a tomato bacon but apple bacon is even better!